Puget Sound Sage has just released a new analysis of state labor trends show that private sector businesses are increasingly transforming regular, full-time jobs into part-time, temporary or contract positions. The full report, Washington’s Changing Workforce is available on our website. The report finds that nonstandard work now accounts for nearly a third of private sector employment in Washington, or about 916,000 workers according to an analysis of Current Population Survey (CPS) data. Although this figure likely under-counts the share of jobs that are nonstandard, a conservative estimate shows an increase from 27.8% in 2007 to 31.7% in 2010, the latter figure exceeding the late peak of 29.6% in 2004. One of the greatest drivers of this trend is that a growing number of workers can only find part-time work. In the past, most people who worked PT did so voluntarily because of care giving, work obligations, school, and—in the case of retirement-age workers—because of Social Security limits on earnings. However, as private sector employers seek to cut labor costs, workers are not arriving at PT work arrangements by choice, but are pushed into these forms of employment because they are unable to find FT employment. In fact the share of prime working age adults (25-64) who are working PT involuntarily has more than doubled since onset of the recession. 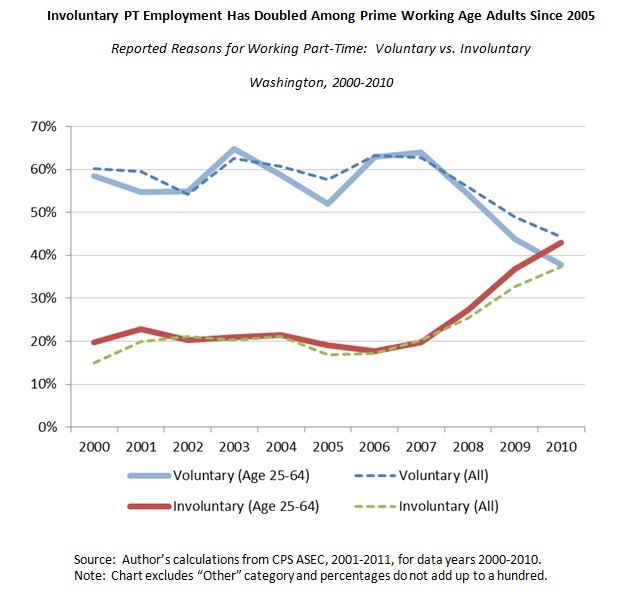 In 2009, for the first time the rate of prime working age adults who are working PT involuntarily exceeded those working PT by choice. 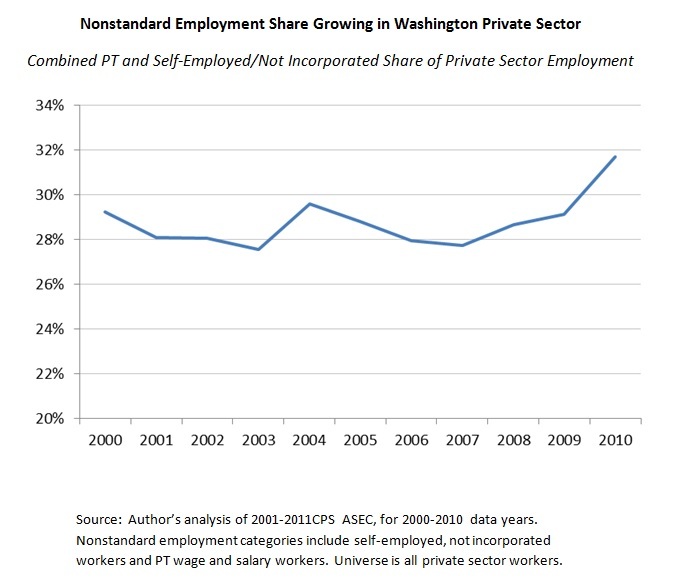 What does this mean for Washington workers? Less income, less stability and increased pressure to work more than one job to make ends meet! It also means that as more corporations are becoming dependent on part-time, temporary and contract workers, they are effectively cut their workers off employer-based health care. For more information about how the increase in nonstandard employment in Washington affects access to quality health care read our report Washington’s Changing Workforce. Categories: Living Wage Jobs, Uncategorized | Permalink. Seattle’s real estate market is back, which means big projects in downtown. But as developers begin to sell the public and local government on the merits of their projects, community members in the downtown area are skeptical. Will big projects provide real benefits for Seattle residents, or create more problems? After sitting on the land for years, Seattle’s R.C. 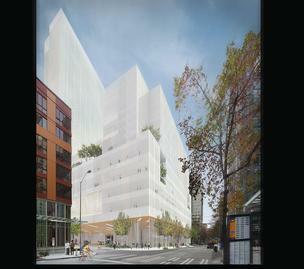 Hedreen Company has launched plans to build a mega hotel in the heart of downtown Seattle. The project will sit on the old greyhound bus site at 9th and Stewart and will reach the highest allowable height in downtown at 400ft tall. The plans include 1620 hotel rooms, and 150,000 net sq. ft. of convention space. To give you a sense of the scale, the total proposed amount of meeting space is greater than the combined meeting space in Seattle’s Sheraton, Westin, Hyatt and Hilton hotels. The project will employ over 1,000 workers (over 700 will work in the hotel). However, the jobs will likely be low-wage, no benefit jobs with unsafe working conditions. Because of these characteristics hotel jobs have historically put significant pressure on tax-payer funded public services. For example, from 2006 to 2010, the State of Washington spent at least $44 million to cover an average of 4,224 uninsured hotel workers per year. Existing area tenants, home owners and congregation members have begun to raise concerns about the impacts of the project. Given the scale of the project, leaders argue that this project warrants an environmental impact statement (EIS) and increased attention to traffic impacts and pedestrian safety. Local elected officials and public servants overseeing the design aspects of the project should follow the community’s lead. An EIS, typically required on large projects, would not only uncover potential environmental impacts, it will also examine the project’s impact on public services. If hotel workers do not earn living wages and have opportunities to live close to work, will the project lead to higher burdens on city, county and state budget in terms of social, health and transportation services? These are important questions that must be investigated in a public process, with input from residents and other community stakeholders. Community members know the potential impacts and envision a different reality for this project. Their efforts hinge on making the project stronger, with an eye towards the experience of project neighbors, the environment and the impact to our local economy. The Greyhound hotel project is currently under design review. Before it goes forward, the project will go to the Seattle Design Commission and to City Council for an alley-vacation approval – a process to privatize the publicly owned alleyway that will allow for the 150,000 square feet of convention space. This process requires process requires an in-depth review of community benefits provided by the projects, look for a future post on the process and what the community benefits packages need to include. Categories: Affordable Housing, Community Benefits and Development, Living Wage Jobs, Sustainable Communities, Uncategorized | Permalink. How Can Sea-Tac Airport Become a First Class Port? Sea-Tac Airport has fallen behind minimum workforce standards set by other major West Coast Ports. Other cities and ports in the coastal region have made significant gains toward reducing poverty, increasing customer service and creating safer and more secure operations. 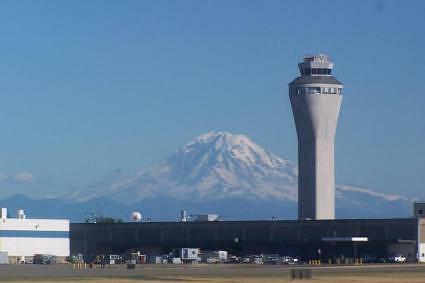 However, Sea-Tac Airport’s governing body, the Port of Seattle, has yet to lay out a serious agenda to keep up. Raise Worker Wages: All four airports raised wages to reduce poverty in their cities. Thousands of airline contractor employees on the West Coast currently earn $3.74 to $6.18 more per hour than their counterparts at SeaTac. Paid Sick Leave: Concerned with the public cost of care for uninsured airport workers, as well as the risk of exposure to H1N1 and potential pandemics at the airport, LA’s City Council offered paid sick days and offered a health insurance incentive for workers at the Los Angeles International Airport. Develop and Implement Workforce Standards: San Francisco’s Board of Supervisors implemented workforce standards at San Francisco International Airport to address the adverse effects of low wages and high turnover. Fifteen months after implementing these standards, employee turnover fell dramatically, decreasing by an average of 60% among firms that experienced average wage increases of 10 % or more. How did they do it? By implementing minimum compensation standards, enhanced hiring practices, improved working conditions and increased training. They also established a Health Care Accountability Ordinance, which guaranteed quality health insurance for most port workers. Implement a Living Wage Policy: After learning about low-wage working conditions at Oakland International Airport, Oakland voters overwhelmingly approved (78%) a living wage ballot measure for all airport workers. A similar policy will go to the voters of the City of SeaTac in November 2013. For more information about this initiative read our post on the Good Jobs Initiative. Categories: Living Wage Jobs, Port Jobs | Permalink. 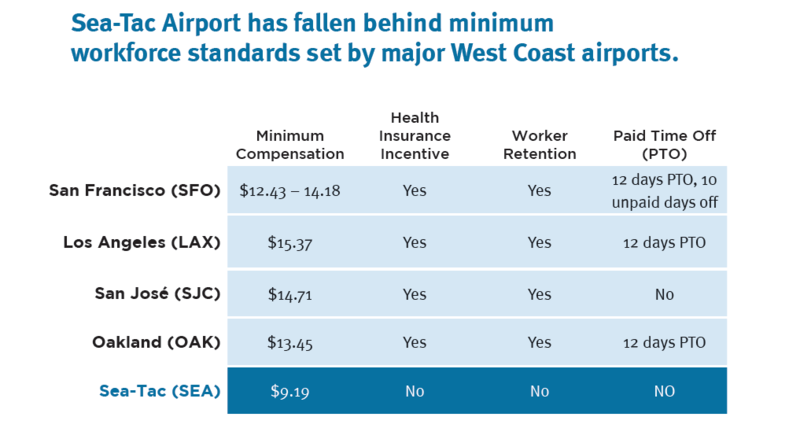 In sharp contrast to Sea-Tac Airport’s governing body, the Port of Seattle, public officials in four West Coast cities – San Jose, Los Angeles, San Francisco and Oakland – have implemented quality work standards for airport workers. Such standards aim to reduce poverty, increase customer service, and create safer and more secure operations. Although notable decisions at the Port have set new standards for a “race to the top” for executives including Port Commissioners and the CEO, many other airport workers rank near the bottom in terms of pay and benefits among the airport’s west coast peers. How can the Port of Seattle make Sea-Tac a First-Class Airport? Follow the example of their west coast counterparts. These same four airports have implemented standards to reduce poverty, strengthen safety and security, improve public health and minimize the public cost of their workforces. For more information about how, read our blog article or visit our website to view the full report.